In the previous section we described the need of an Enterprise Content Manager (ECM) that is common to all companies. CIFKM is a simple, efficient, natural and intuitive solution because it applies current technology to traditional concepts. CIFKM can be gradually implemented. One can start using CIFKM to meet a specific need of the company and then gradually extend its use to new possibilities. There is no need for a complete initial specification of all requirements. Yesteryear, documentation was saved in filing boxes. Now, in CIFKM the files and the information related to each matter is incorporated to a “Data Smart Box”. These are intelligent containers (each one is a small application) and in them are placed the attributes, metadata, notes, links, automatic notifications, files and folders, related to the matter and in each "Smart Box" is specified which "user groups" can access it and with what faculties ("Smart Box Roles"). In a flat organization, i.e. without structure and levels, CIFKM can be managed so that all users have access to all "Smart Boxes" with all the powers (all accessible and transparent for all). In this case, only one comprehensive general group of all users will be used. However, companies from a certain size upwards are organizations of people with areas of activity, structure and levels (chart positions). In this case, users are organized in "User Groups". Any one of them may be nested in any other. This way, one may represent both, the functional and the organic structure of the company. In each “Smart Box” are inserted the "user groups" whose members may access it and to each of them is assigned a “Smart Box Role”. The possibility of nesting groups in others allows, for example, certain groups that represent positions in the organizational chart to be nested in the groups of the areas, committees,… over which they have some responsibility or participation. Thus, in any reorganization one will only have to substitute users in the affected positions of the organizational chart, represented by "User Groups" with only one member, which maintain their roles and faculties. In each "User Group", one or several “Group Roles” are assigned to users (whether or not they are members of it) which are related, either to the management faculties of the Group itself or of the "Data Smart Boxes" in which the "User Group" is included. To facilitate the creation of “Data Smart Boxes” by the users with only one click, their characteristics are predefined in a “Smart Box Template”. Thus, the users have to incorporate the contents and assign values to the attributes and links to the "Smart Boxes". The templates may differ considerably from each other depending on the purpose of the “Smart Boxes” that are created with them, but many may also be practically identical, being differentiated only by the "User Groups" (for example, different areas of the company) who are going to have access to the “Smart Boxes” created with the template. Each template is made available to “User Groups” that must use it. Thus, in each template are inserted the Groups and assigned "Template Roles" to them, that may be executed by the users of the Groups (members and non members) with the "Group Role" named "read/use" assigned in the Group. 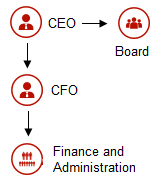 In the previous paragraphs, different types of “roles” have been mentioned. Each is a set of faculties that have been previously configured. There are 4 types of roles that respond to the typology of faculties that they comprise. These are “User Roles”, “Smart Box Roles”, “Group Roles”, and “Template Roles”.